SEKTION is finally here! I had to see for myself so I took the trip to my local IKEA. A sign saying “SEKTION: a new kitchen with more of everything” greeted me at the entrance to the kitchen section of the showroom. I was pretty excited to see it in person, so I snapped a few photos with my phone. Here were just some of my favorite things. I didn’t even look at the new styles for the cabinet doors and drawer fronts until I had investigated the drawers-inside-of-drawers. That’s a VARIERA flatware tray in the top of the two drawers. I really liked how the additional drawers just naturally lent themselves to better storage. You can also see some of your classic IKEA favorites like the GRUNDTAL rails and the ever-funky HJUVIK faucet. Those VARIERA spice jar inserts are not new. But putting them under the stovetop? Perfect. The VARIERA storage boxes are another inexpensive way to create inner organization. Look at those open cabinets to each side of the stovetop! It seems that they ‘hacked’ the shelves and used LÄMPLIG trivets instead of actual melamine shelves. This is a great way to make use of those little leftover open spaces, and the openness is visually interesting next to all of the storage with doors. 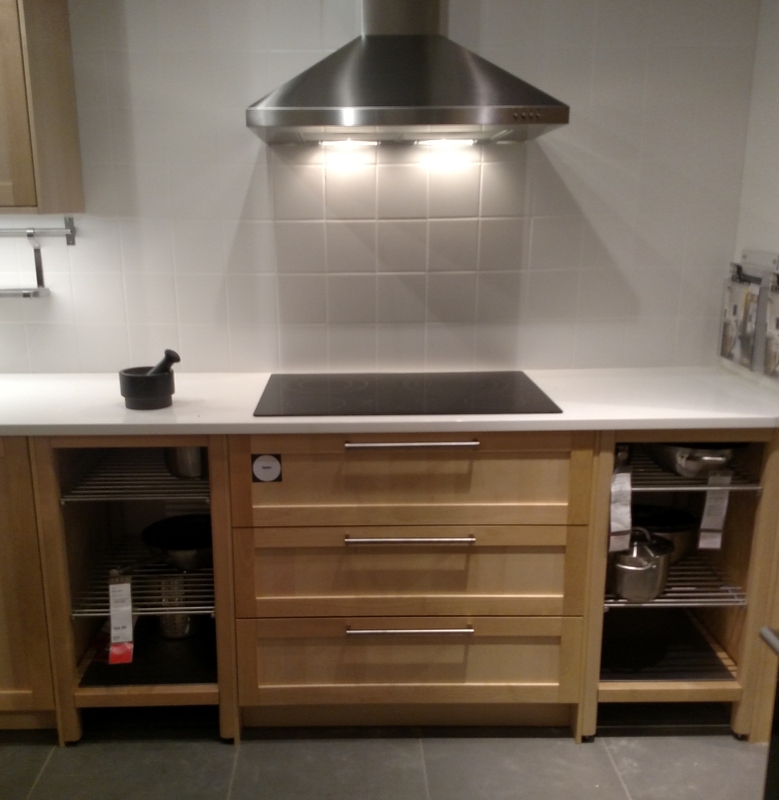 When I got to this particular IKEA kitchen look, I finally noticed the cabinet door and drawer fronts. Up close and in person, I liked the BROKHULT cabinet doors more than the catalog revealed. No need for cabinet handles here. The cabinet doors open with a push, meaning a cook with their hands full can open them with their elbows. Very handy. With LIMHAMN cabinet legs, you can raise your kitchen cabinets. Raising the cabinets off the floor is an ideal choice for pantries in hot, humid locations, or those prone to critter infestations. Ahhh, those bold, yellow high-gloss JÄRSTA doors. My picture doesn’t really do them justice. Did I check to see if there was a UTRUSTA pullout trash can tray below the sink? No, and I could kick myself. So let’s pretend I did look and it was there. Sure, those TUTEMO open kitchen cabinets are pretty. They pop with color! But look at that VÄRDE wall shelf to the right. Don’t you think this would be perfect for a small kitchen? The IKEA showroom kitchens were gorgeous, naturally. But it was when I saw this that SEKTION really made sense. My first thought was, “this looks so plug-n-play.” But I’ll cover this more in another blog post. And in case you missed it, we’re ready to get started on your SEKTION kitchen. We can’t wait to design a beautiful kitchen for you.